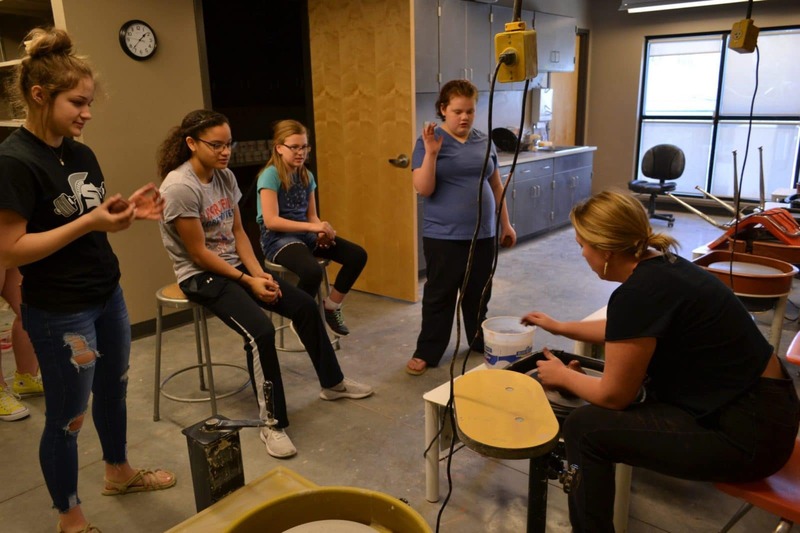 Emporia Arts Center – Emporia Arts Center is a nonprofit organization dedicated to enriching lives through its mission to "Educate, Advocate, and Celebrate the Arts". 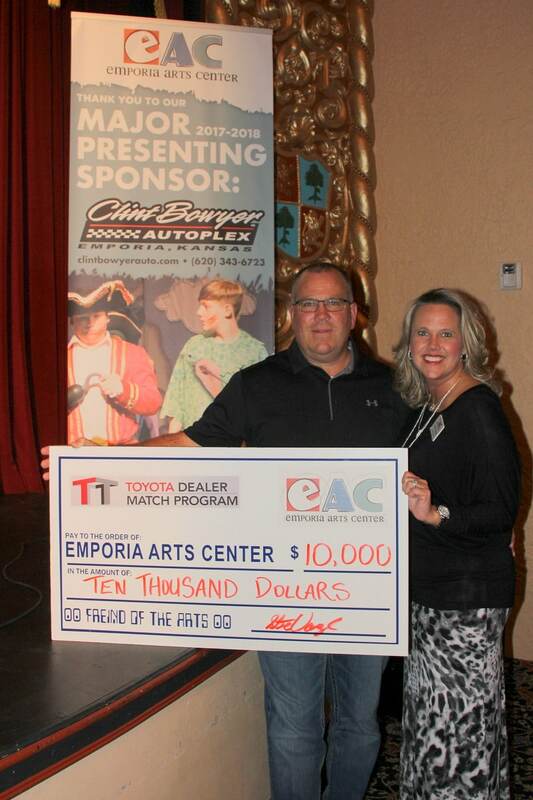 Emporia Arts Center is a nonprofit organization dedicated to enriching lives through its mission to "Educate, Advocate, and Celebrate the Arts". 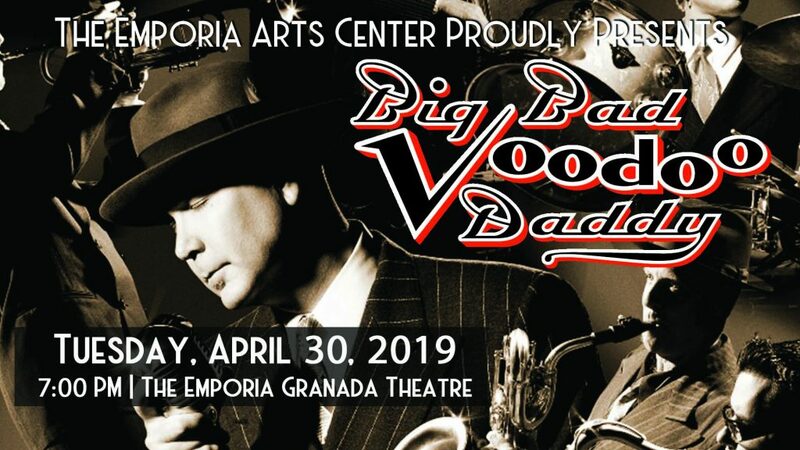 The Emporia Arts Center invites you to join us on Tuesday, April 30, 7 pm at The Emporia Granada Theatre for a roaring night of jazz and swing music as Big Bad Voodoo Daddy takes the stage. 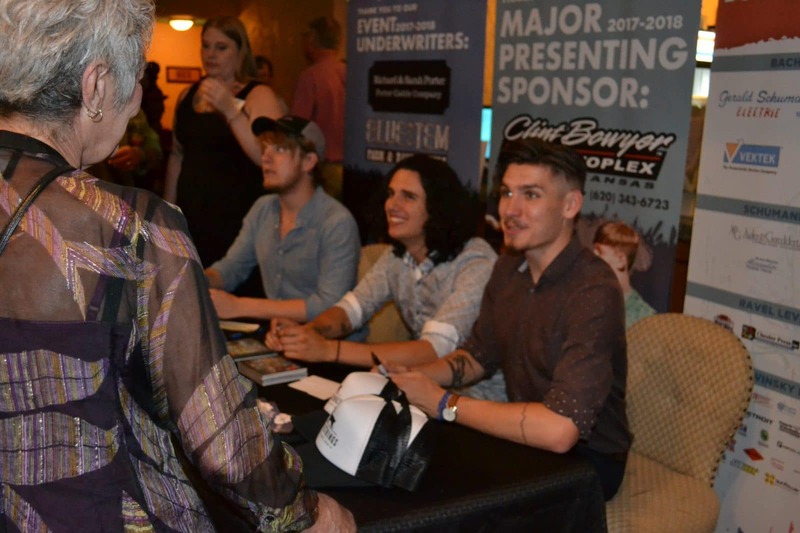 Since it’s formation in the early nineties in Ventura, California, the band has toured virtually nonstop. Early on, they reminded the world, in the midst of the grunge era no less, that it was still cool to swing! What’s in store at a Big Bad Voodoo Daddy performance? 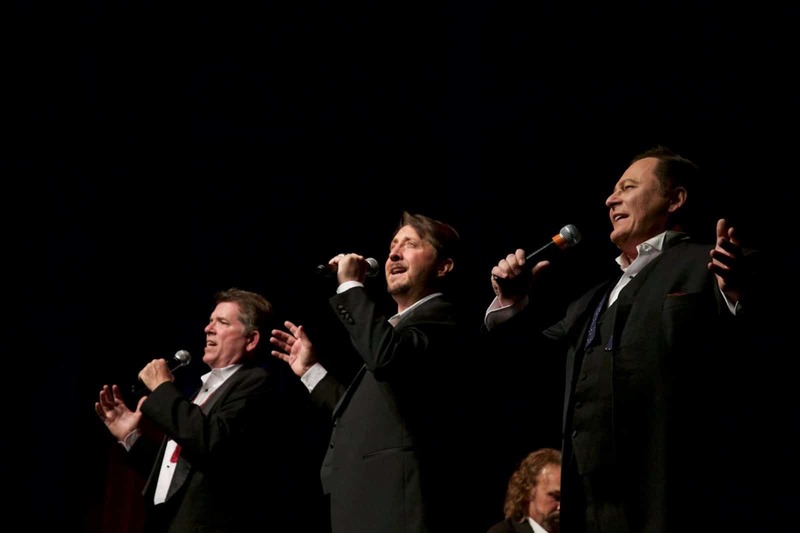 A rousing good time, with exuberant and dapper-dressed musicians who turn a performance into an experience. 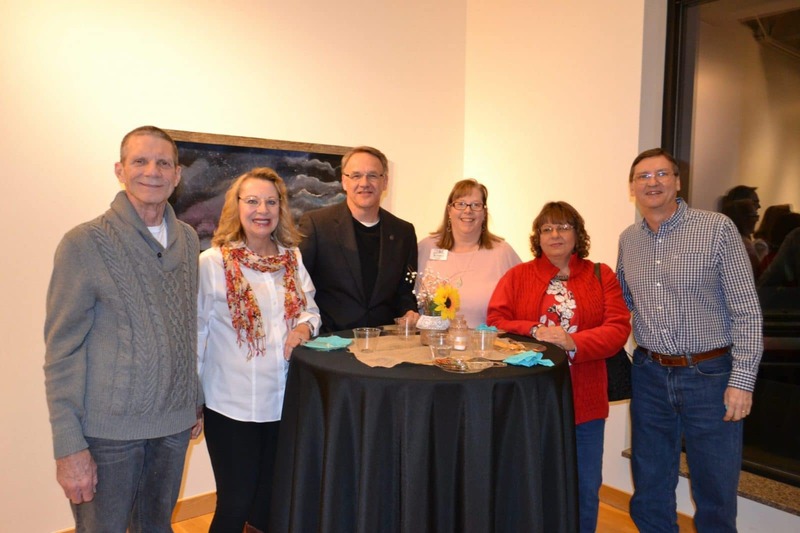 PURCHASE TICKETS HERE and at 815 Commercial St. or call (620) 343-6473. 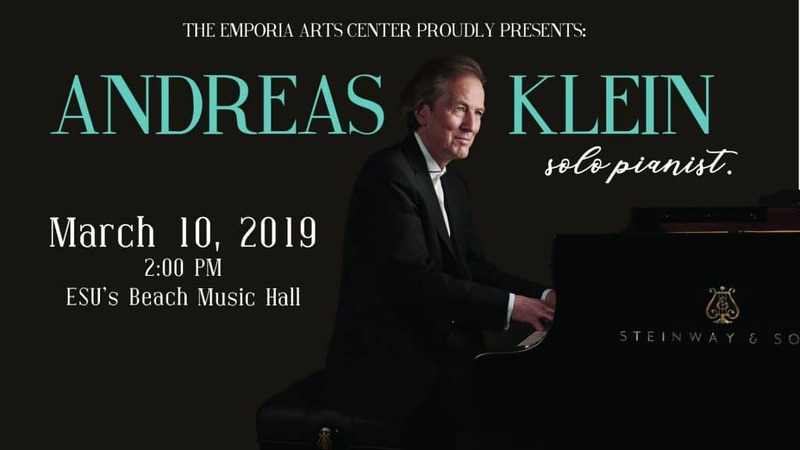 The Emporia Arts Center invites you to join us on Sunday, March 10, 2pm at Beach Music Hall for an afternoon filled with touching musical artistry as world renowned pianist Andreas Klein graces the stage. Since his meteoric start in his native Germany, performing recitals and as a soloist with orchestra, he eventually answered the call to go to the Juilliard School in New York. Klein has performed in many of the leading houses of Europe, from Wigmore Hall in London to the Berlin Philharmonie, as well as Carnegie Hall in New York and the Kennedy Center in Washington DC, and is at home with the grandeur of playing with the Berlin Philharmonic or the vast reaches of Ravinia Festival(where he received TWO standing ovations) as he is with the intimacy of Le Poisson Rouge (NYC). The audience of Klein’s concert can expect an emotional performance featuring works from Schumann, Brahms, Mozart, and the like. Klein’s flowing musicality allows listeners to feel the sensitivity of classical music. Klein will bring taste, touch, and tone to the keys, unlike any other pianist. See why the New York Times calls Andreas Klein “a pianist who makes silences sound like music” in a performance video below. 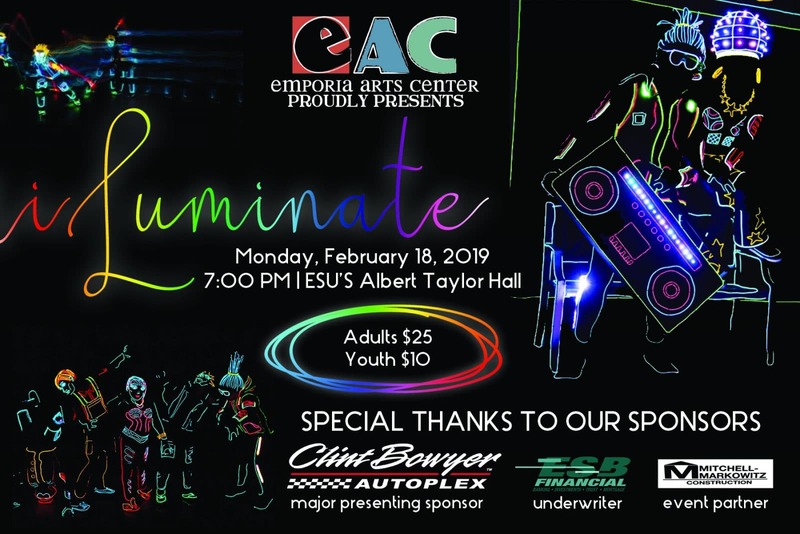 Join us on Monday, February 18, 7pm at Albert Taylor Hall for a heart-racing and jaw-dropping performance by artists of light, iLuminate! iLuminate combines state of the art technology with trained dancers to create an unbelievable spectacle. A completely blacked out stage brings the electroluminescent lights on the dancers suits to life creating illusions that will reawaken your senses. Expect to see mind-bending dance moves set to a range of music styles from current hits to classic jams. Reaching the finals and being named the “Best New Act in America” by America’s Got Talent judges, iLuminate delivers a completely unique performance to anything you have ever seen. 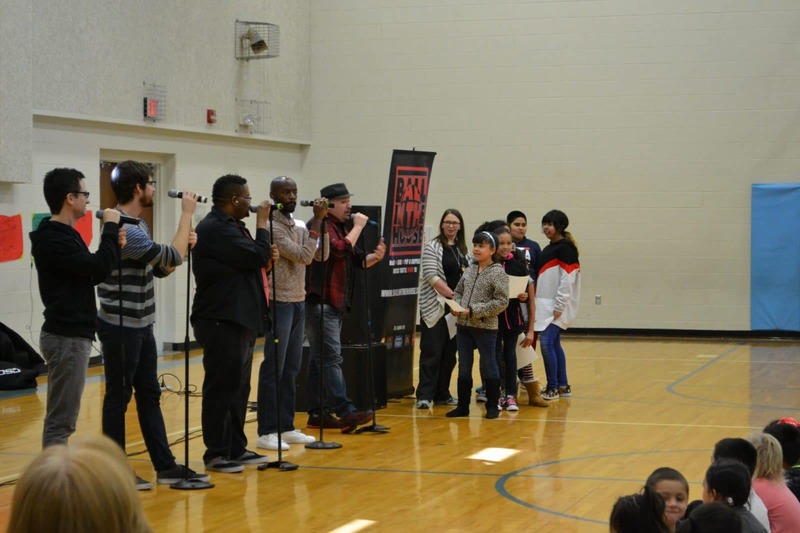 Their groundbreaking combination of storytelling, music, and technology will leave you speechless. 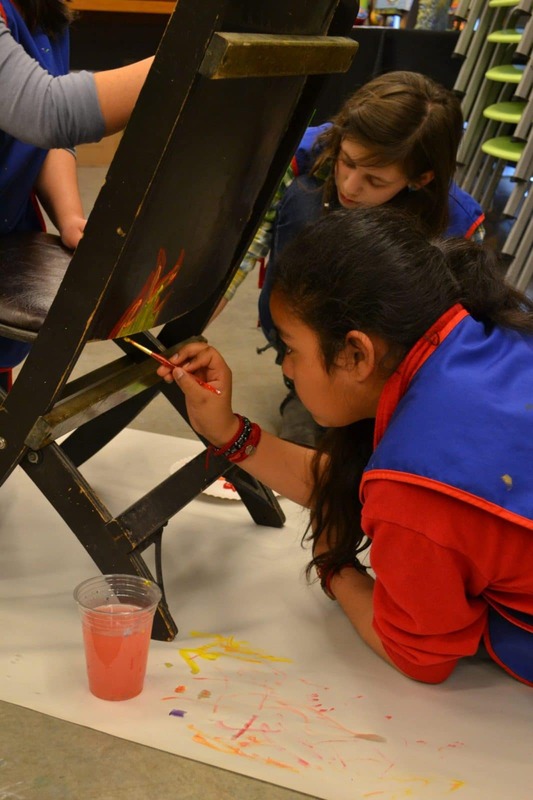 PURCHASE TICKETS HERE and at 815 Commercial St.
Take a sneak peek of the iLuminate magic below! 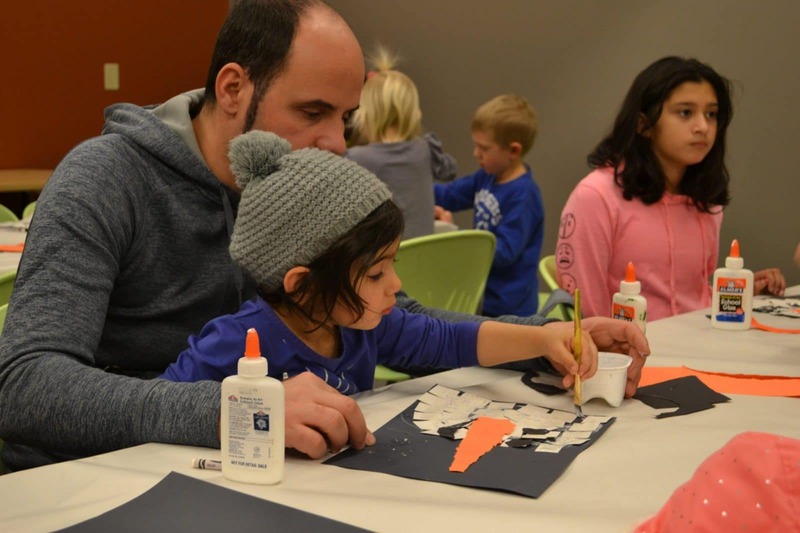 It’s the most wonderful time of the year, and EAC can help make it even better! 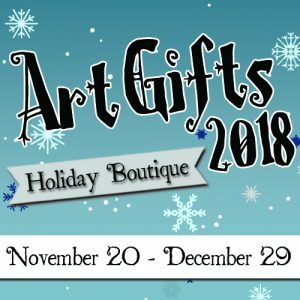 Welcome to the 2018 Art Gifts Holiday Boutique Gift Guide. We have taken the guesswork out of your holiday shopping and expertly selected unique gifts for everyone on your list that will show you care! Here are 10 creative solutions for those hard-to-shop-for names on your list! Looking to stand out at your holiday parties this year? 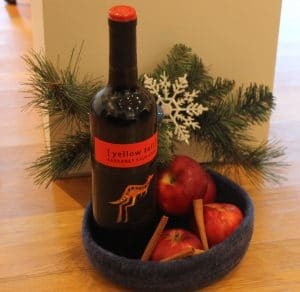 Gift your host a bottle of red wine, include the ingredients for your favorite mulled wine, and slide it all into into a beautiful handmade woolen cozy created by Jodi Heermann. With this sweet gift we’re sure you’ll be invited back. 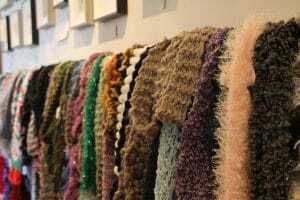 Our walls are lined with the warmest and cutest handmade hats, gloves, and scarfs from many different crafts-people. The style-savvy man or woman on your list won’t be afraid of outfit-repeating with these luxurious knits… but you might have a hard time picking a favorite so you might as well get them two! 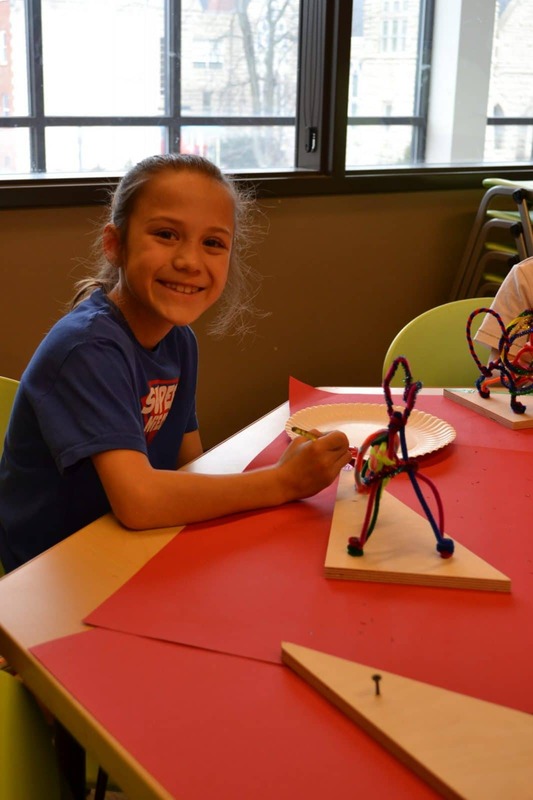 Fidget spinners and slime are so last year, but kids still love mind-bending gadgets. 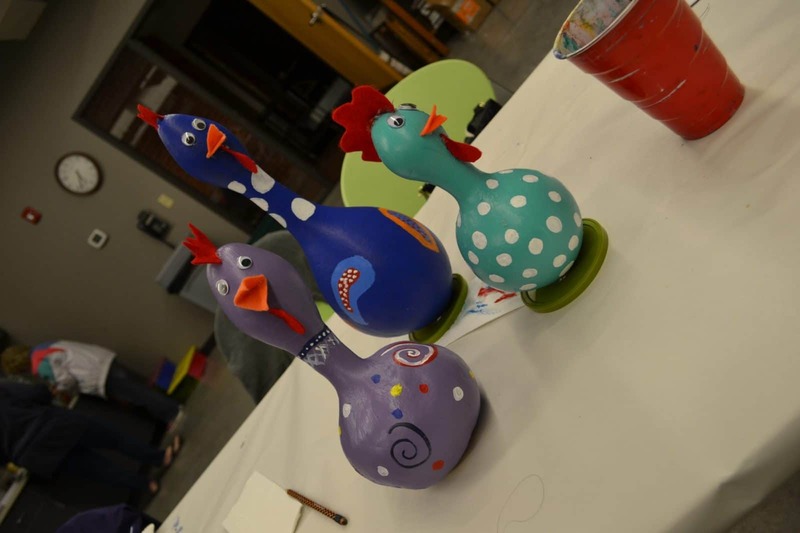 Check our the incredible handmade kaleidoscopes. 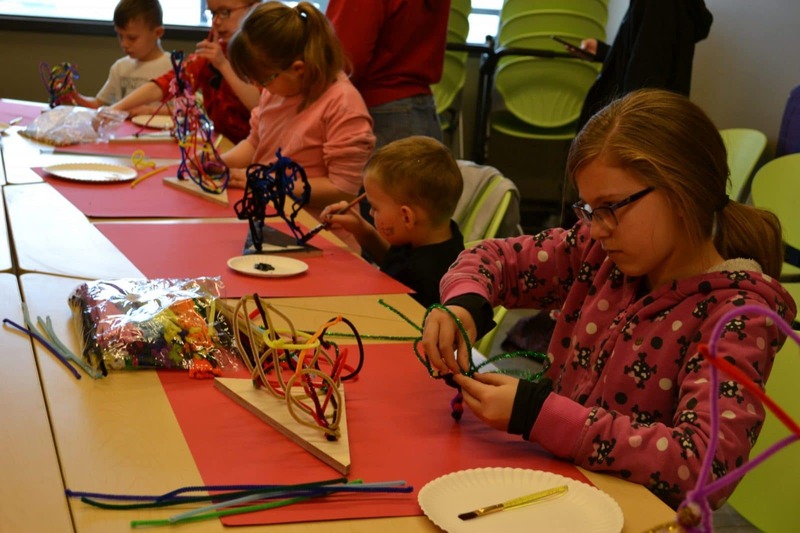 These kaleidoscopes are unique, great for keeping busy during long road trips, and it is sure be in this kid’s backpack for show-and-tell after winter break! 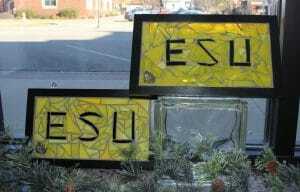 Do you know a Hornet mega-fan that is always sporting ESU from head to toe? 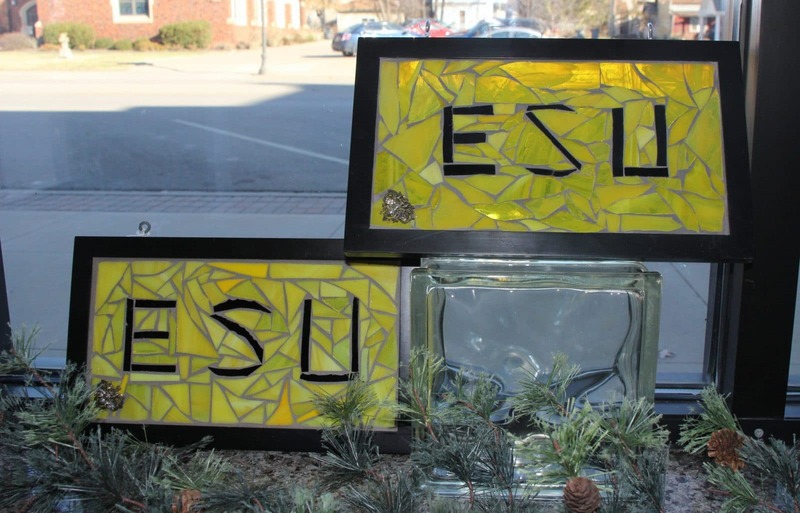 Instead of amping up their already complete Corky wardrobe, deck out their man-cave or she-shed with a piece of handmade ESU glass mosaic in sparkling gold and black. Stingers up! They’ve been there and done that, twice… what more could they need? 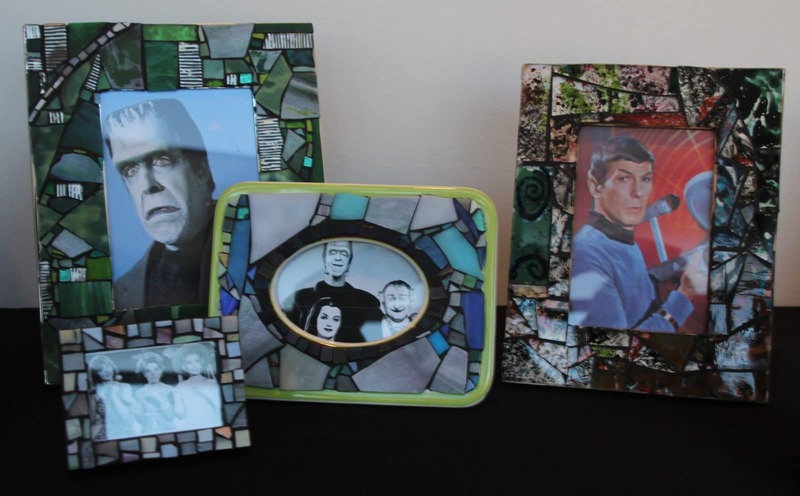 Help them hold onto those memories with a handmade mosaic frame. In a variety of sizes our artisan crafted frames each have a unique design, making them perfect for collecting not-so-standard memories of travels abroad. Someone who spends all day in an office and somehow keeps the entire workplace in sync deserves a little peace. You can’t afford to send them away on the scenic vacation they deserve and they wouldn’t have a second in their fully-booked schedule to take it anyway. 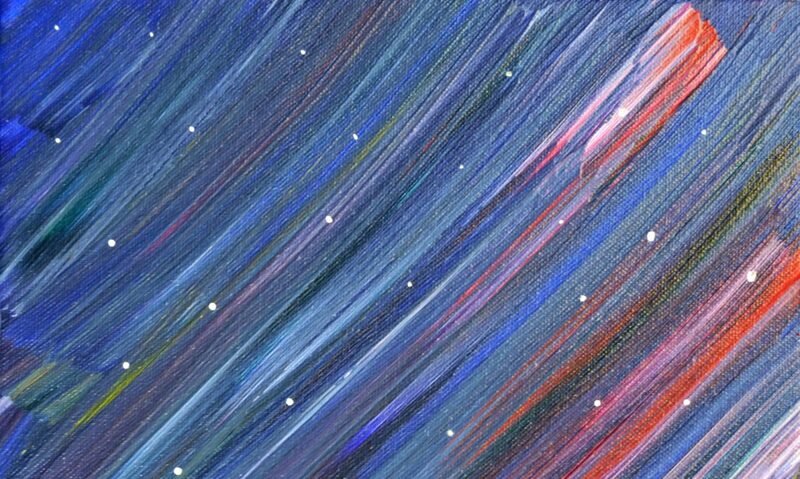 Relax their mind and their office with one of the fantastic landscapes or other paintings we have. Waterfalls, countrysides, and majestic animals in realistic scenes will transport their mind to paradise after a coffee-fueled work day. This person can be found sporting fuzzy socks with a mug of hot cocoa in their hands preparing for a Netflix marathon on any weekend where the temperature drops below 60 degrees. 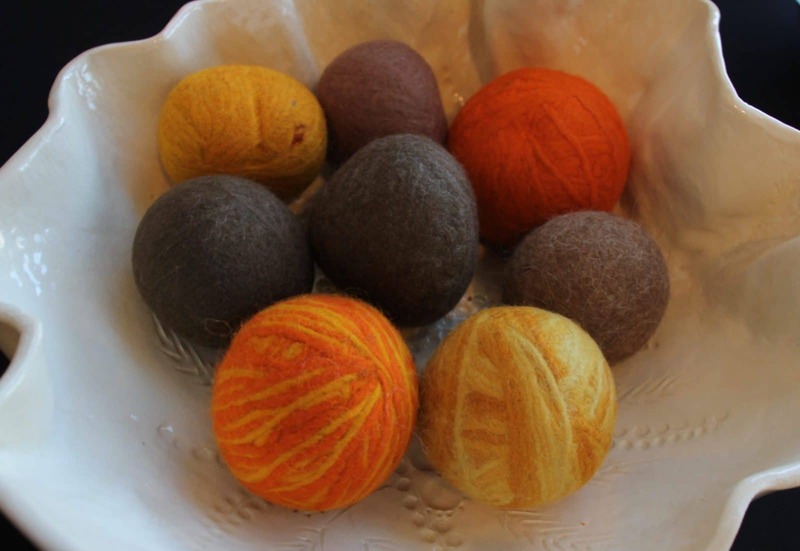 They are collectors of all things comforting and soft, so keep their favorite sweats soft as can be with handmade wool dryer balls. They soften the fibers naturally and gently, and everyone loves a fuzzy blanket they can wrap up in fresh out of the dryer without any static cling! 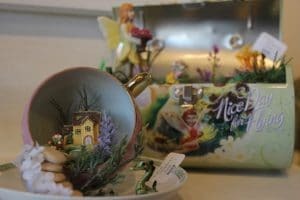 Let them keep their head in the clouds but their feet on the ground with one of these unique and magical faerie gardens. These mystical little treasures are intricately created with the fantasy lover in mind. Best of all, this is one garden you won’t have to water and it will keep your imagination thriving for years. Phone. Wallet. Keys…Panic! Make their morning run, bike ride, or car ride to the gym a little less hectic with a handy key-ring that fits flat or slides effortlessly onto your hand/wrist. 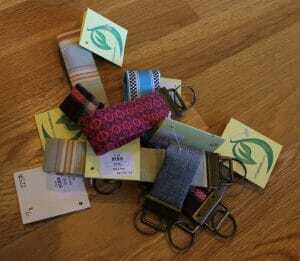 Perfect for those flat waistband pockets in athletic wear, these key-rings are hand-sewn and come in a variety of bright colors that you’ll spot from anywhere. The perfect stocking-stuffer to get your athlete out the door and on the field even faster. They share everything from secrets to socks and they are a package deal at any social gathering, so get them a gift that can grow with their relationship. Literally. 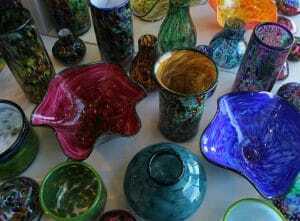 We have dozens of handmade ceramic or blown glass planters and vases that liven up any fresh plant, or packet of seeds if you’re waiting for the frost to pass. A potted plant will remind the couple how much their relationship has grown and will continue to. There you have it, 10 unique holiday gift ideas you won’t find at the supermarket or mall this year. 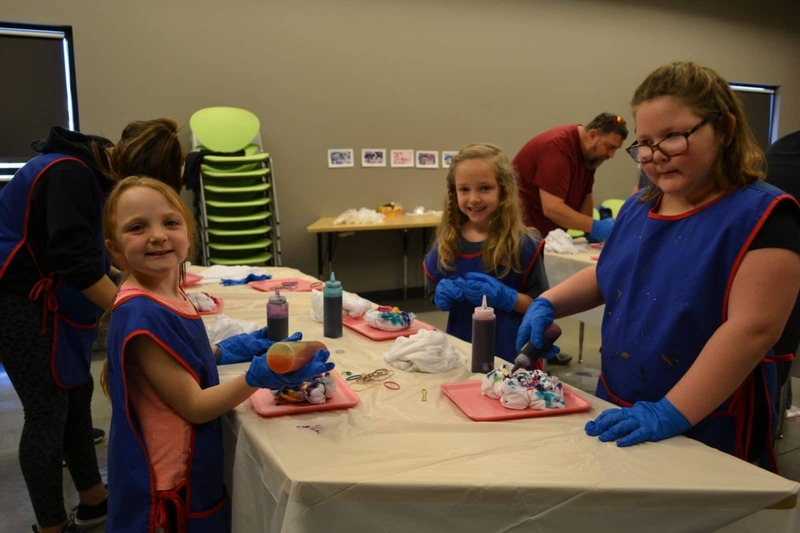 All gifts mentioned are in limited quantities and won’t last lang as many are one-of-a-kind creations., but remember we have MUCH more than you see here! Stop by 815 Commercial St. to check out our collection of Art Gifts until December 29th! 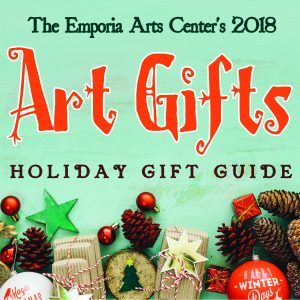 Celebrate and shop this holiday season with Emporia Arts Center! 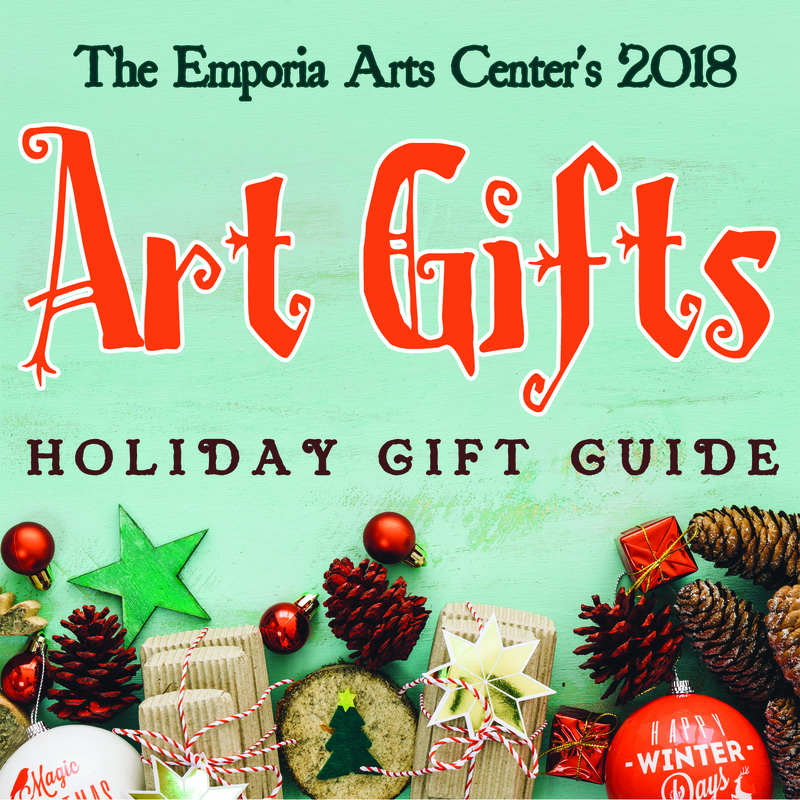 Beginning November 20 we invite you to explore our Trusler Gallery, as Emporia Arts Center presents ART GIFTS: Holiday Boutique! 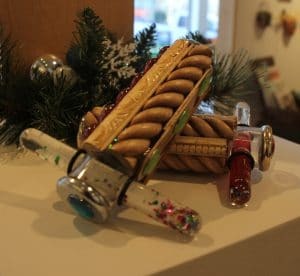 The EAC elves have worked tirelessly to fill the gallery with hundreds of unique creations from over 50 talented artists. Our inventory boasts artwork in various forms; jewelry, ceramics, paintings, photographs, fibers, prints, glass, woodwork, books, and the list goes on and on! 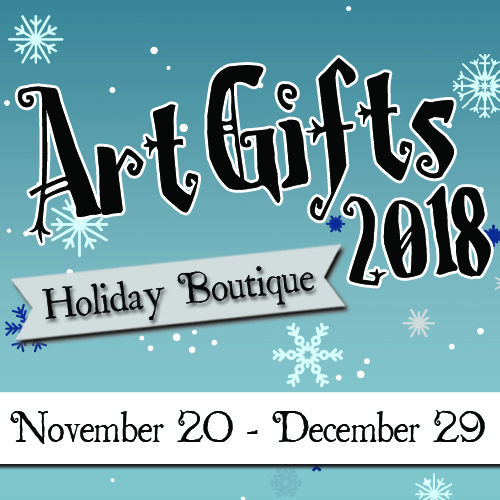 Please join us for the Art Gifts Holiday Boutique Open House on November 24, Small Business Saturday, 10:00am – 4:00pm. 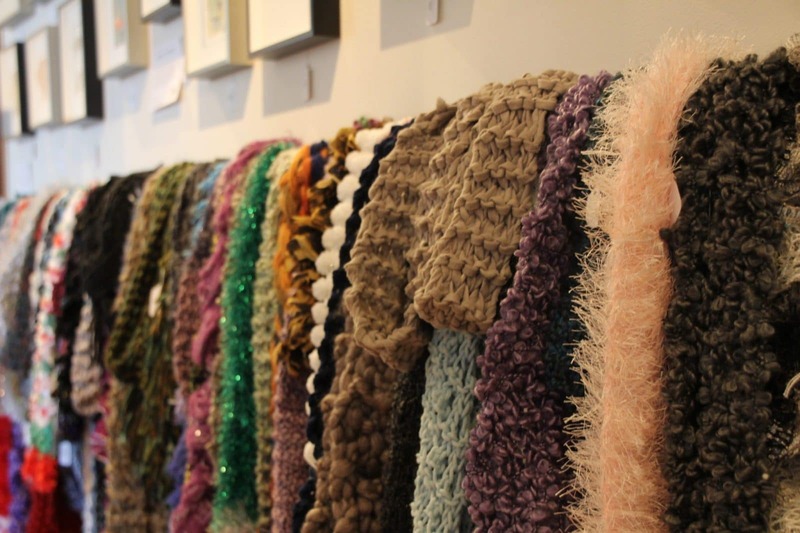 Come browse our selection and support your local makers! 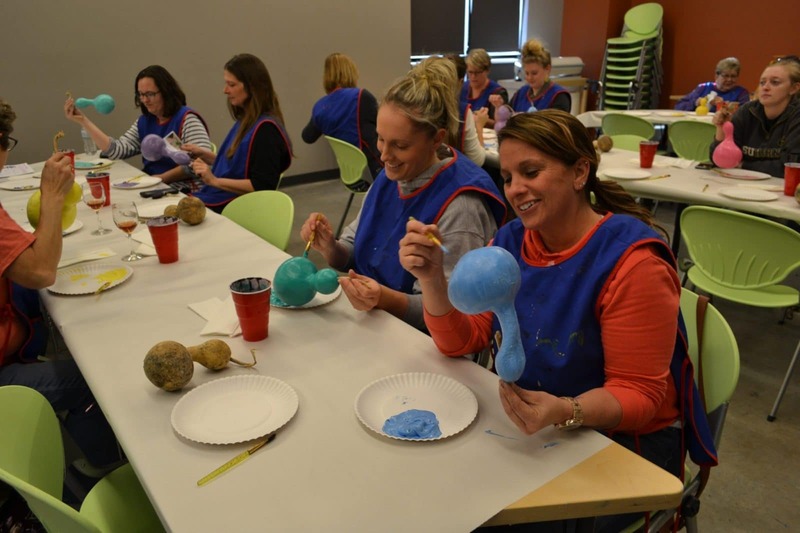 The EAC staff has A LOT of work ahead of them to get the Trusler Gallery and the Glaser Gift Store ready for our 2018 Art Gifts Holiday Boutique! We will be closed to the public on Tuesday (11/13), Wednesday (11/14), and Thursday (11/15) but we will do our best to return phone calls and emails promptly. 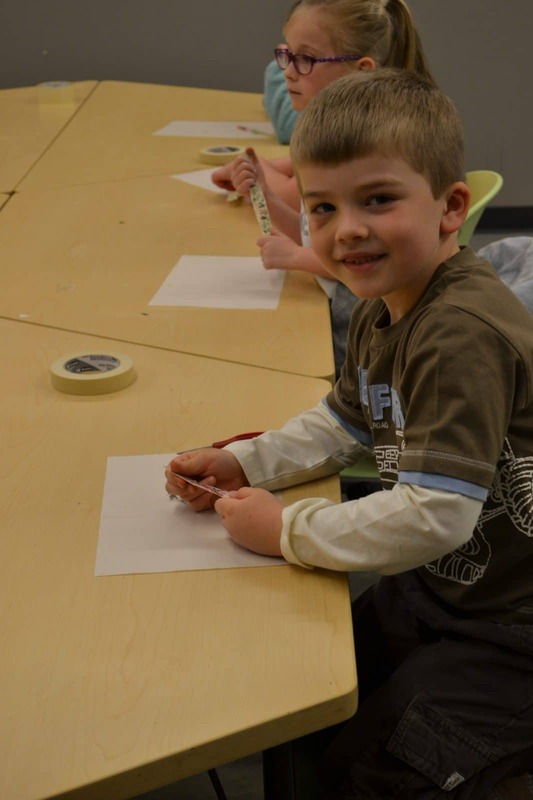 Thank you for your patience, and we can’t wait for you to see all of the great Art Gifts this year! 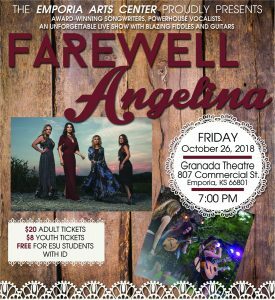 Join us FRIDAY, OCTOBER 26TH for a superstar act with killer songs performed by all-female country group, Farewell Angelina! Farewell Angelina leaves everything they have on stage every night. 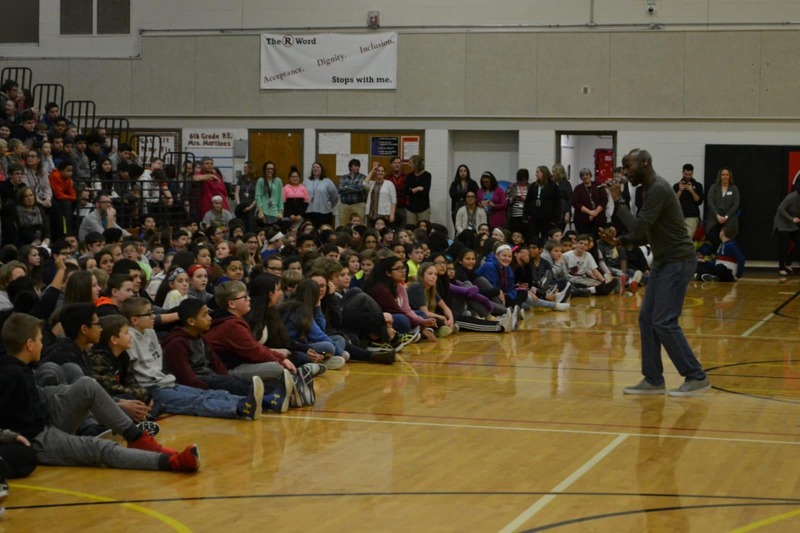 They create “moments” – not for their audience, but WITH their audience. Fiddles, guitars, harmonies, and a dash of attitude. Expect these four strong women to deliver sophisticated songs that matter to radio and fans hungry for real depth, artistry and perspective. 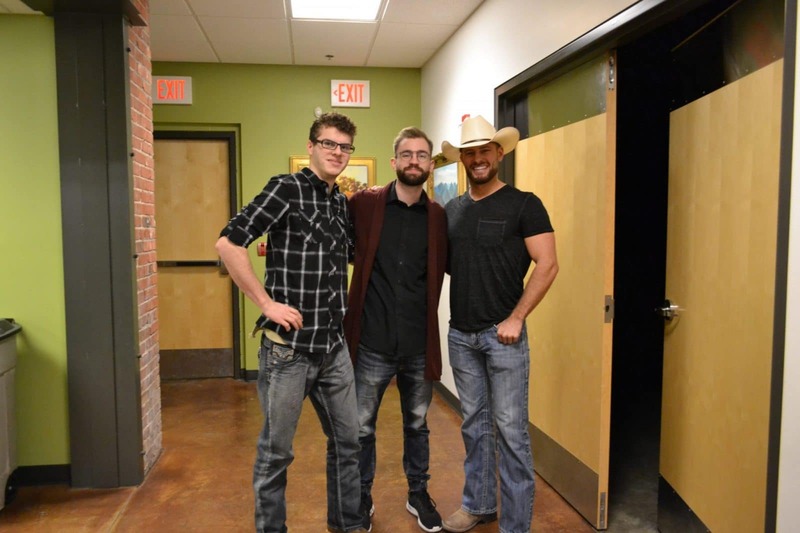 Check out their amazing single Roughstock(and EAC!) calls “Our favorite new country song” : If It Ain’t With You. 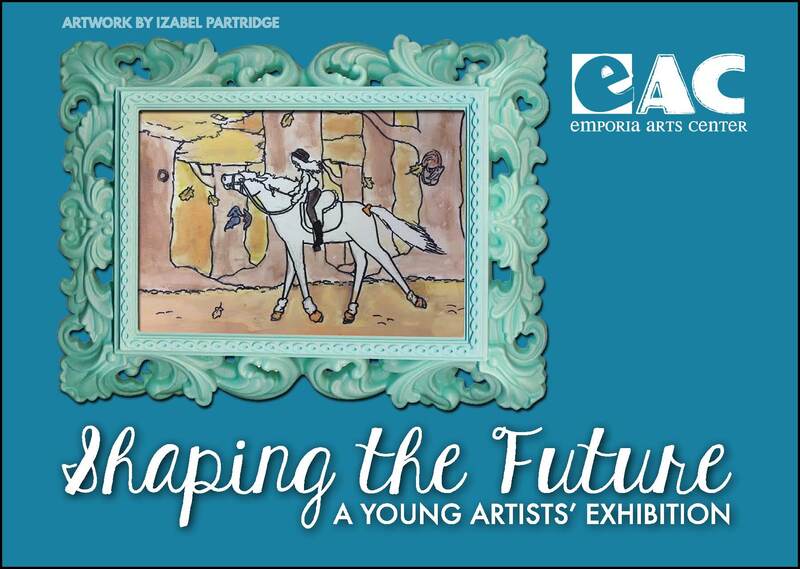 TICKETS HERE and at 815 Commercial St.
Go to the Exhibitions tab for more information! We are kicking off our 2018-2019 Performing Arts Series with the mind-bending and soul-grasping talent of MOMIX. Under the direction of Moses Pendleton and with nothing more than a bit of light, shadow, props, and the human body, MOMIX has astonished audiences on five continents for more than 38 years. 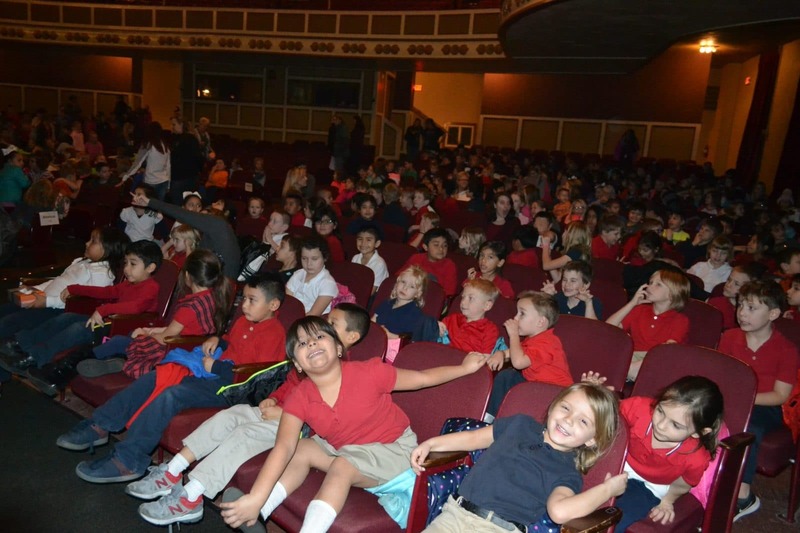 One night only at Albert Taylor Hall on Emporia State University campus, world renowned dancer-illusionists, MOMIX, will take you on a sensory journey through the American Southwest in their performance OPUS CACTUS. 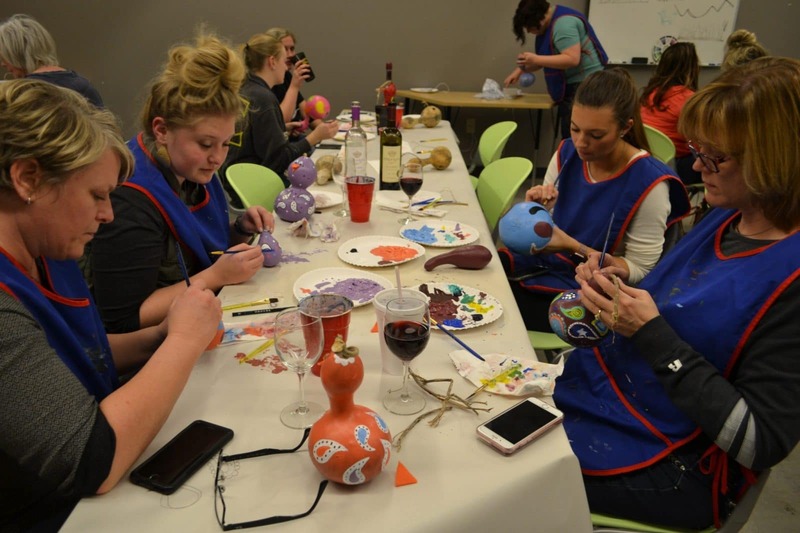 Opus Cactus promises a night of of fun and surreal experiences for the whole family. Natural elements like slithering snakes and huge saguaro cacti combine with the physical artistry of MOMIX to magically translate the hidden beauty of the southwest. 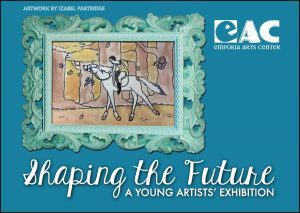 oria Arts Center is excited to host “Shaping the Future: A Young Artists’ Exhibition” in the Trusler Gallery. 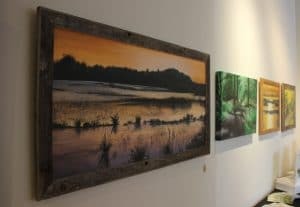 The show will be on display from August 1 -August 25, 2018. 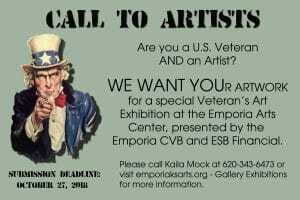 An Artists’ Reception will be held from 5:00 p.m. – 7:00 p.m. on Friday, August 3 during the Emporia First Friday ArtWalk. 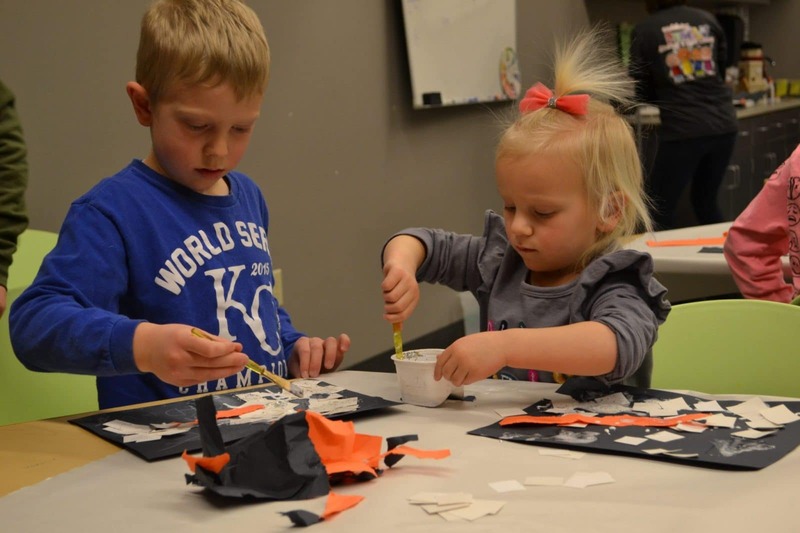 “Shaping the Future” is open to all children in Emporia and surrounding communities between the ages of 5 and 17. Artwork must have been created by the submitting artist in the last year and 2D paper artwork must be framed. EAC can only accept one entry per person and an entry form must be completed for each entry. All mediums are welcome (drawing, painting, photography, ceramics, jewelry, sculpture, ect…). 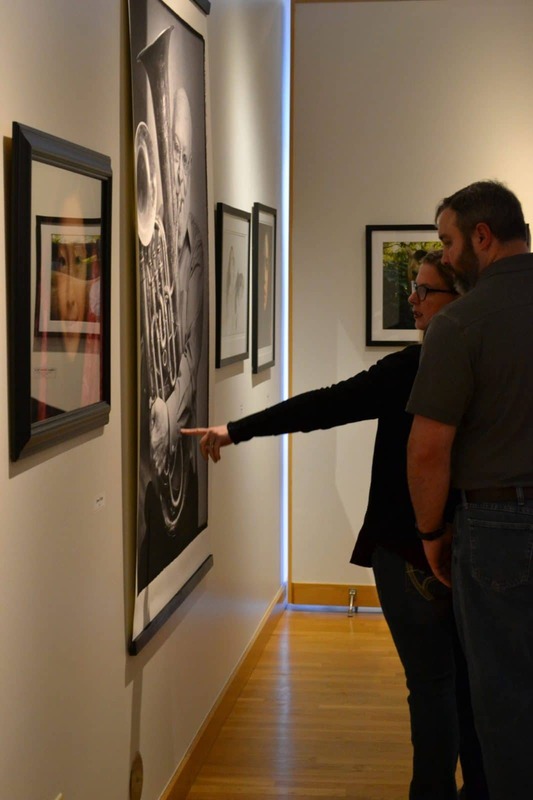 EAC will begin accepting artwork submissions on July 17 (not before) and the deadline for submission is July 28 at 3:00 p.m. No late entries will be accepted. 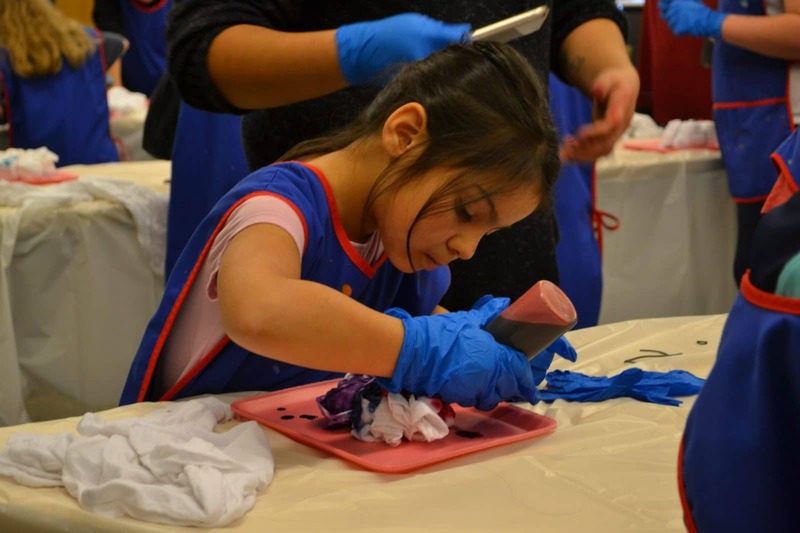 A panel of judges will choose 1st, 2nd and 3rd place winners in each of the 4 age groups and cash prizes will be awarded. 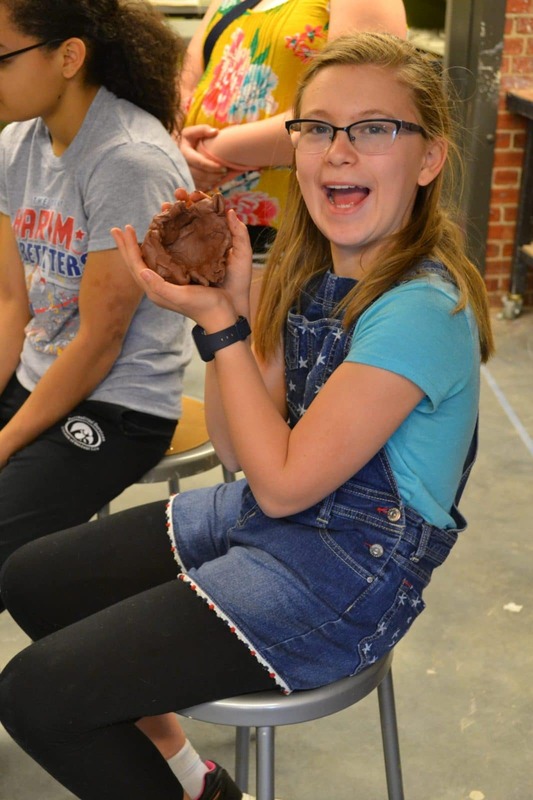 Please join us in thanking Gravel City Roasters for sponsoring this fun exhibition. 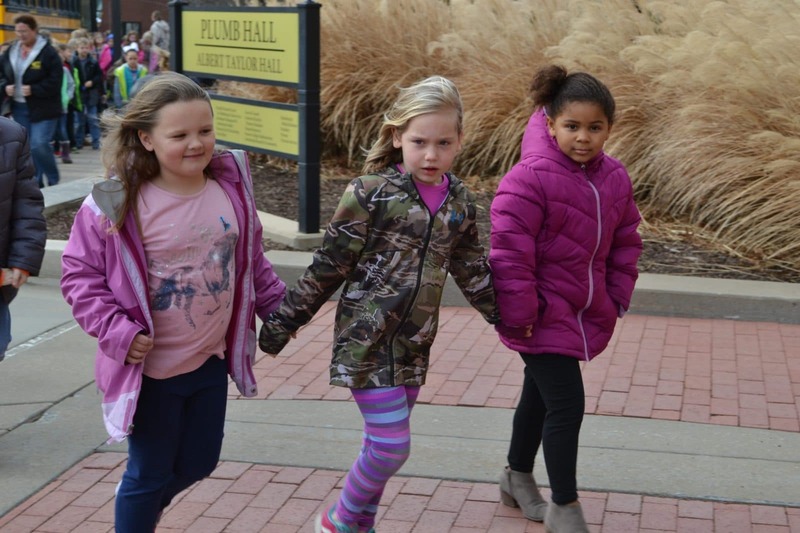 Tues – Fri 10:00 a.m. – 6:00 p.m.